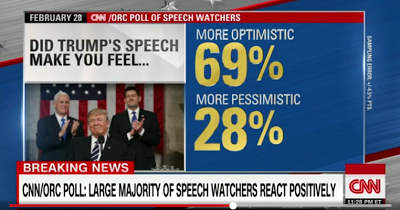 President Donald Trump's first address to Congress received largely positive reviews from viewers, with 57% who tuned in saying they had a very positive reaction to the speech, according to a new CNN/ORC poll of speech-watchers. His speech was very unifying and positive. On specific issues, Trump scored the highest marks for his proposed policies on the economy, with 72% saying those went in the right direction. Almost as many, 70%, said the same about his terrorism proposals. Slightly fewer, but still a majority, felt his policies on taxes (64%), immigration (62%) or health care (61%) were heading in the right direction. Ideologically, about two-thirds saw Trump's speech as about right, while roughly on-quarter (26%) pegged it as too conservative. 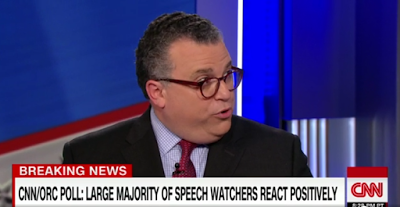 Just 8% said it wasn't conservative enough. He asked for Police and Sheriffs, and community members to unify and make America safe.